This 3-A Sanitary Standard Authorized turbine flow meter is used in plants around the world, in industries including dairy, brewing, wine production, food processing and pharmaceuticals. 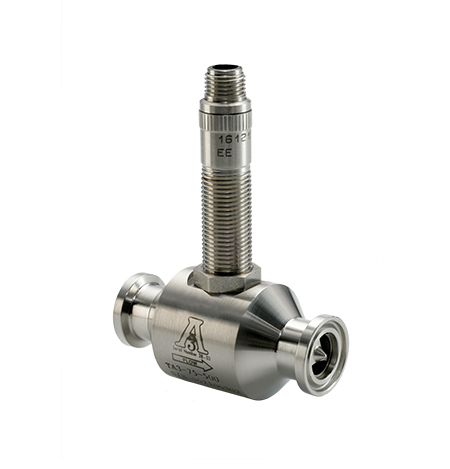 TA3 Sanitary Turbine flow meters are constructed of 316 stainless steel for a durable and economic flow metering in sanitary environments. This meter is 3-A Sanitary Standard Authorized as all materials and polishing technologies utilized during manufacturing on internal components comply with FDA requirements. In service around the world in sanitary industries including dairy, brewing, food processing and pharmaceutical processing. This meter is available in nine different flow ranges from 0.6 to 400 gallons/day, and can withstand system pressures up to 20,000 psi. Durable & Cost Effective: This meter’s rugged 316 stainless steel construction provides a durable and economic flow metering solution to sanitary environments. Excellent Accuracy: The TA3 sanitary turbine flow meter can achieve a flow accuracy up to 1.0% of reading and is repeatable up to 0.1%. Federal Compliance: The most up-to-date polishing technology is utilized during manufacturing on all internal components, and all materials comply with FDA requirements. Flexible: This meter is available in nine different flow ranges, covering flows from 0.6 GPM up to 400 GPM. Versatile: This flow meter provides local flow rate and volume totalization and will interface with most displays, controllers and computers.